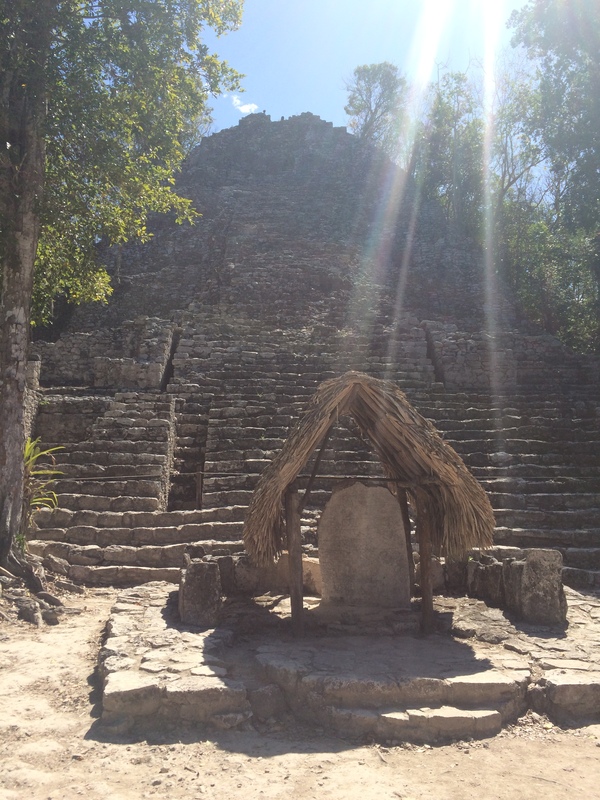 When we left Tulum we headed for the ruins in Cobá. Cobá was inhabited by the Maya before either Tulum and Chichen Itza. The Cobá ruins are very different from the ones in Tulum, because they're located in the jungle, which gives them a much more mysterious vibe. Unfortunately, they are not as well preserved as some of the other ruins, and some parts of the site still need to be excavated, but in a way that adds to the mystery. At the site you'll find several pyramid structures, one of which you can climb. Cobá was the first place where we saw the remains of a "juego de pelota" court. 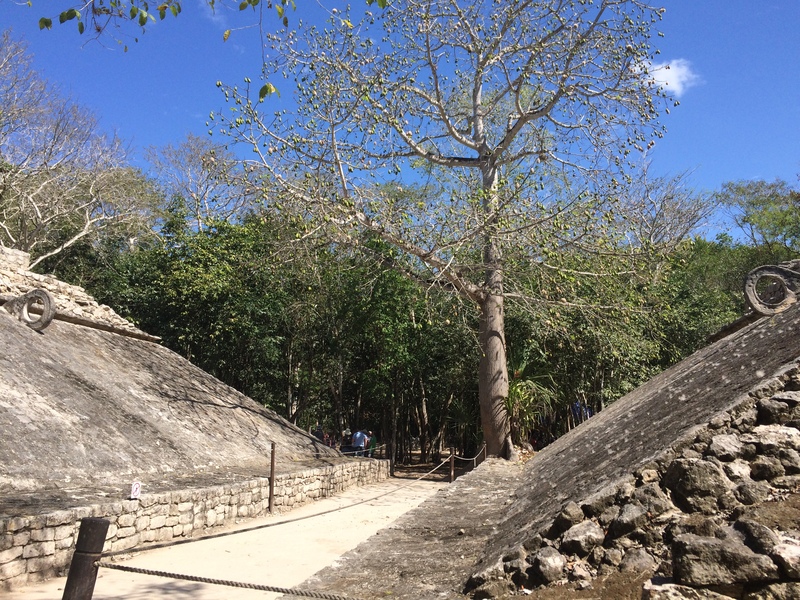 This was the playing field for a ball game played by the Mayas. Researchers believe that in this game players were only allowed to touch the ball with their hips, which must have made it incredibly hard to score a goal, since the goals are located high up the game court. It is also believed that the losing team was sacrificed to the gods after the game. After visiting the ruins we went to Punta Laguna, which is approximately 20 minutes by car from Cobá. 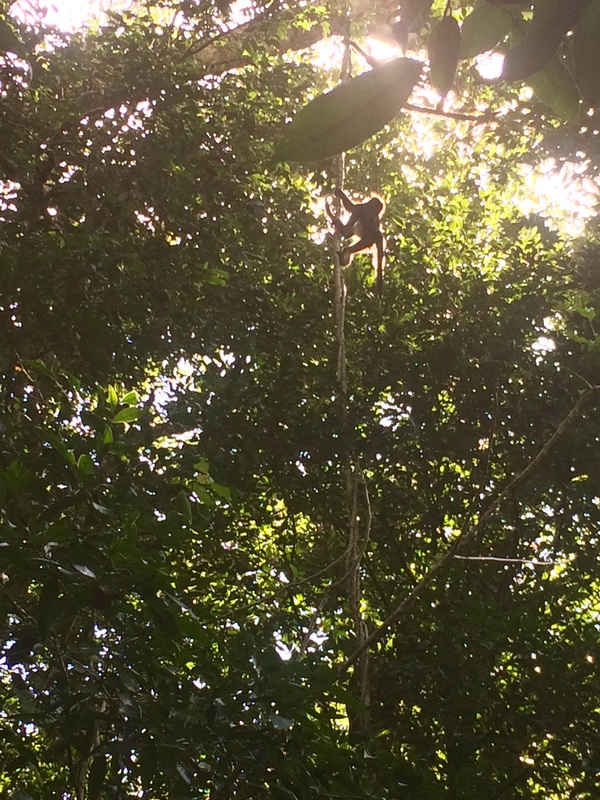 Punta Laguna is probably best known as a good place to see monkeys. The lake and surrounding jungle are all part of a protected natural reserve. A small community of Mayan people live nearby and offer guided tours through the jungle. When we arrived it was incredibly quiet, it almost seemed like we were the only tourists around, which was a really nice change from the busy ruins in both Tulum and Cobá. We had a very friendly guide who pointed out lots of trees and other interesting things while we were looking for monkeys. He also told us that there is a small population of jaguars in the far north-east side of the jungle. 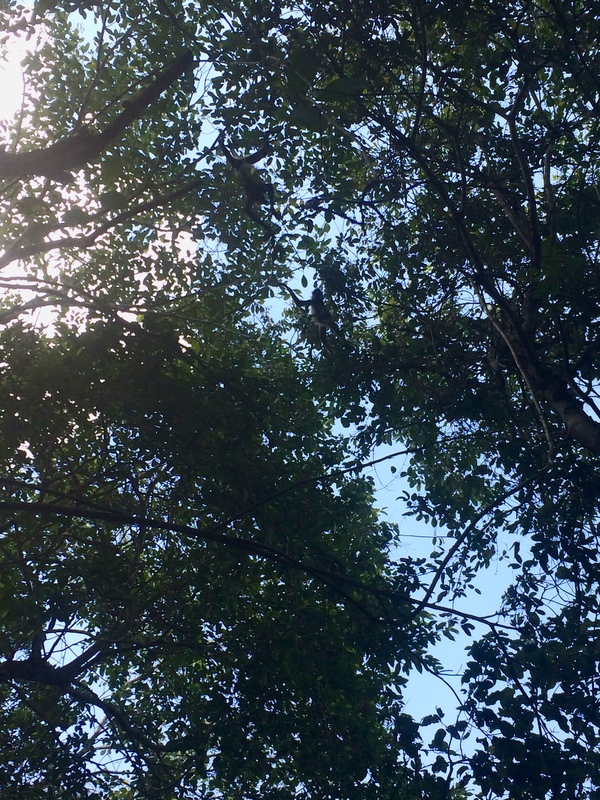 We were really lucky to spot a toucan as well as several spider monkeys on our tour and I would definitely recommend going here if you're keen on discovering some of the natural reserves on the Yucatan peninsula. From the laguna we drove to Valladolid where we spent one night. 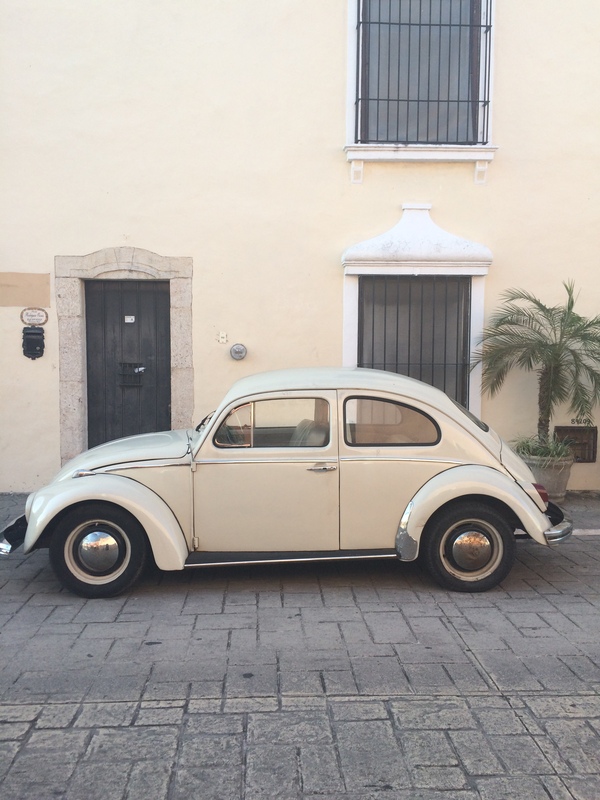 Valladolid is a pretty city, close to several archeological sites and cenotes, and very different from the coastal towns near Cancun. 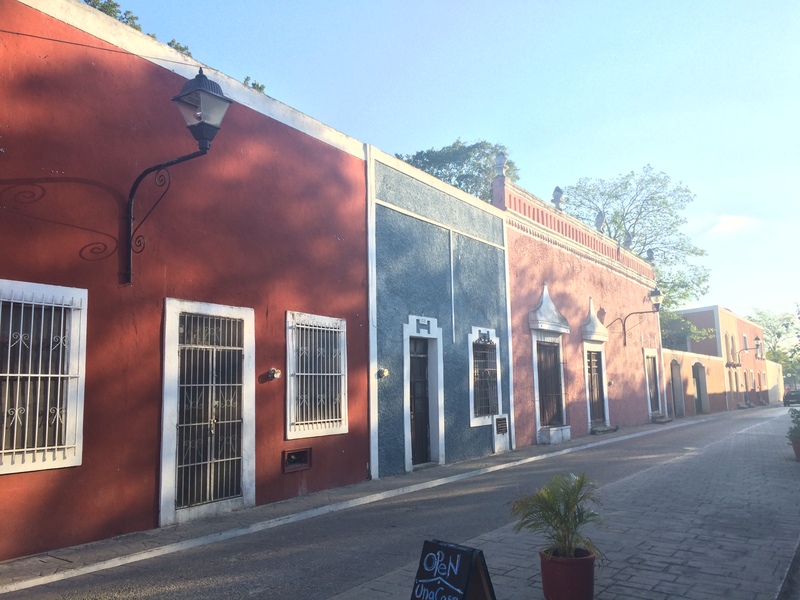 The city has a moving history, being relocated several times and inhabited by both the Maya and Spanish. Nowadays, it's a peaceful place with lots of pretty squares and colourful buildings. We stayed in a really nice hostel called Candelaria. The hostel is very colourful, and has good facilities. It also has a garden where you can relax in one of the hammocks and where they serve breakfast in the morning. For dinner we went to a place called, Conato 1910, which was interestingly enough recommended by both the hostel as well as the Lonely Planet, but we weren't too impressed with the food. They had a huge menu, but most dishes were a fusion between several world cuisines. I had a weird pasta dish with noodles and peanuts. 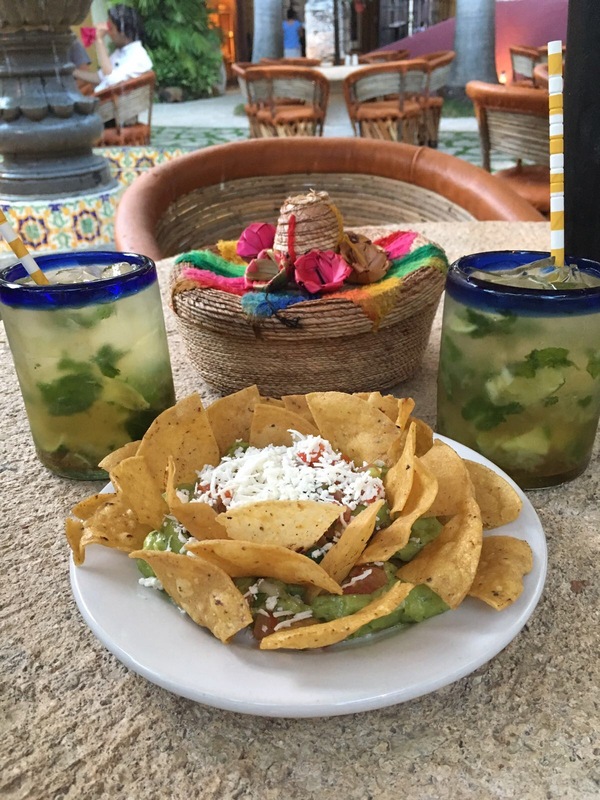 We didn't do too much else in Valladolid, because we wanted to get a good night of sleep and wake up early to go to Chichen Itza. 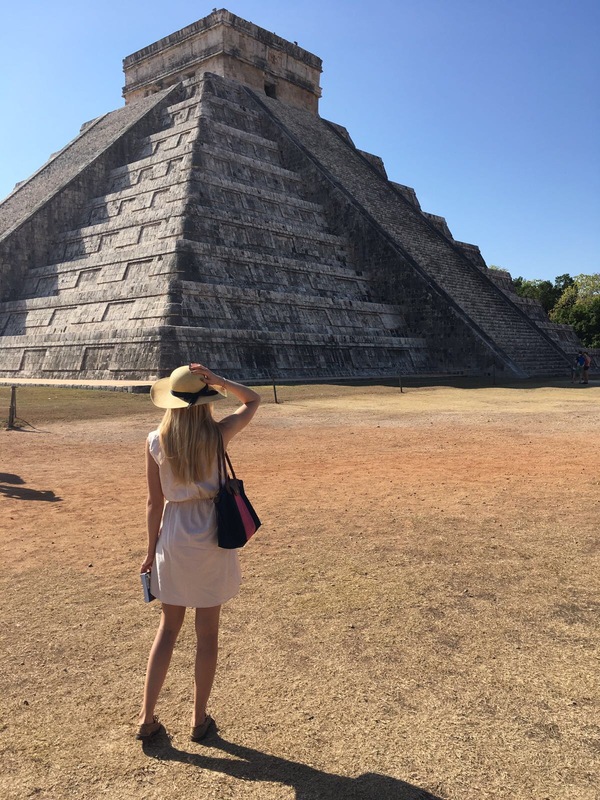 Chichen Itza is one of the most famous archaeological sites of Mexico, and when it comes to visiting the site it really is a case of the early bird catches the worm, or rather, catches Chichen Itza at its best. We arrived there slightly after opening time which is 8am. A queue was already forming at the entrance but by this time the souvenir stalls haven't been set up yet, so you can see the ruins in a slightly more natural state. 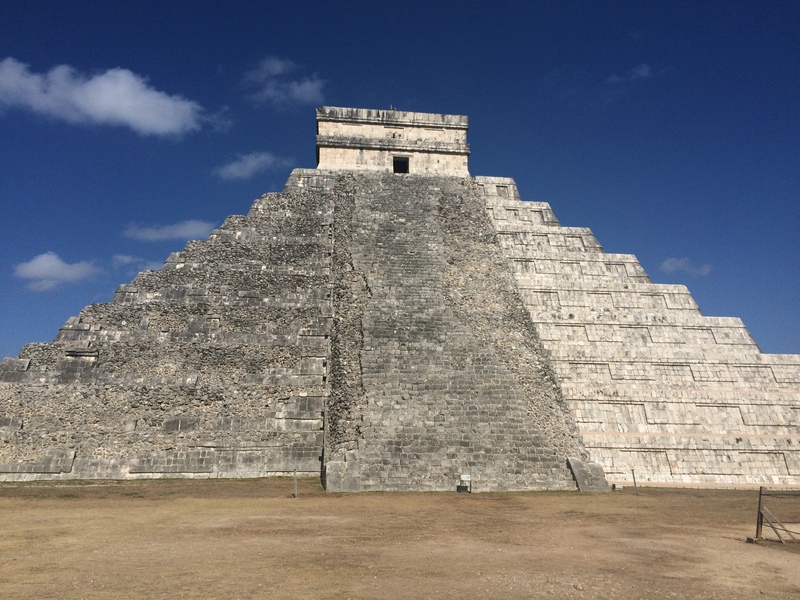 When we booked our trip to Mexico, I was probably most excited about visiting Chichen Itza, and I was definitely not disappointed. "El Castillo" (the big pyramid) is really breathtaking. The site is quite big, probably the largest we've visited. And when you're there you get a bit of an understanding of how a large Maya city would have been like. 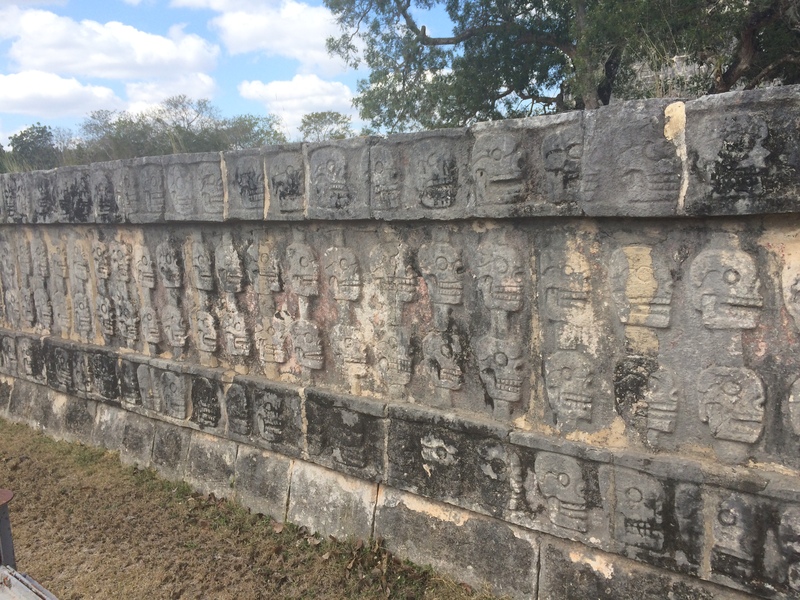 At Chichen Itza it also becomes very clear that human sacrifice was a big part of Mayan society. Lots of engravings show horrendous depictions of jaguars and eagles, the animals that were considered as Gods by the Maya, tearing open human chests and devouring their hearts. There's also a large platform decorated with skulls where the heads of sacrificial prisoners or enemies were displayed to scare the people. One of the most important spots for sacrifice in Chichen Itza was the cenote. When they started diving expeditions in the cenote they didn't only find jade and gold jewellery, but also lots of human bones of people that had been thrown into the cenote as a sacrifice. 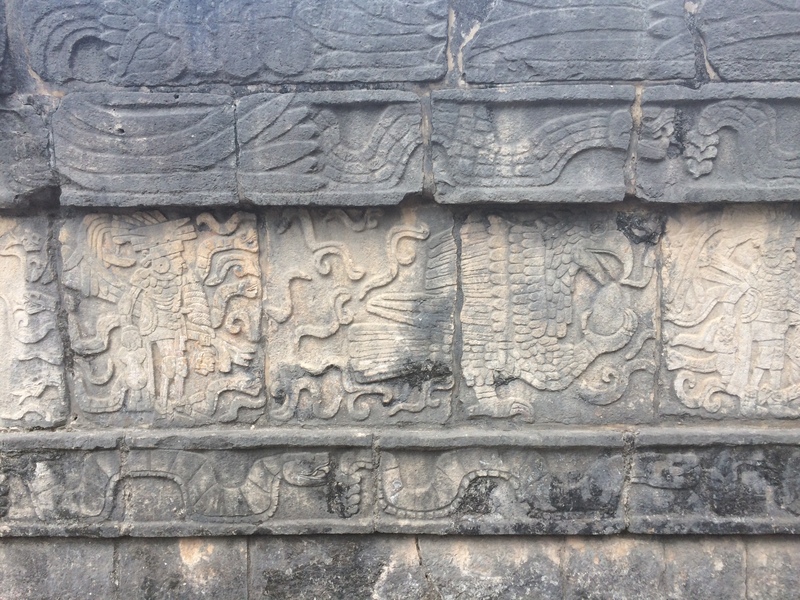 The ball court at Chichen Itza is also fantastic to see, despite the grim engravings of losing teams being sacrificed. The court, called Gran Juego de Pelota, is the largest and said to be the most impressive in all of Mexico. Another interesting feat of the ball court, unrelated to the game, is its acoustics: a conversation at one end can be heard 135m away at the other, and a clap produces multiple loud echoes. All in all, it's no surprise that Chichen Itza is listed as one of the world wonders and you simply can't skip the site if you're visiting the Yucatán Peninsula. As I said before, make sure you go there early in the day to avoid both the masses of tourists as well as the heat. 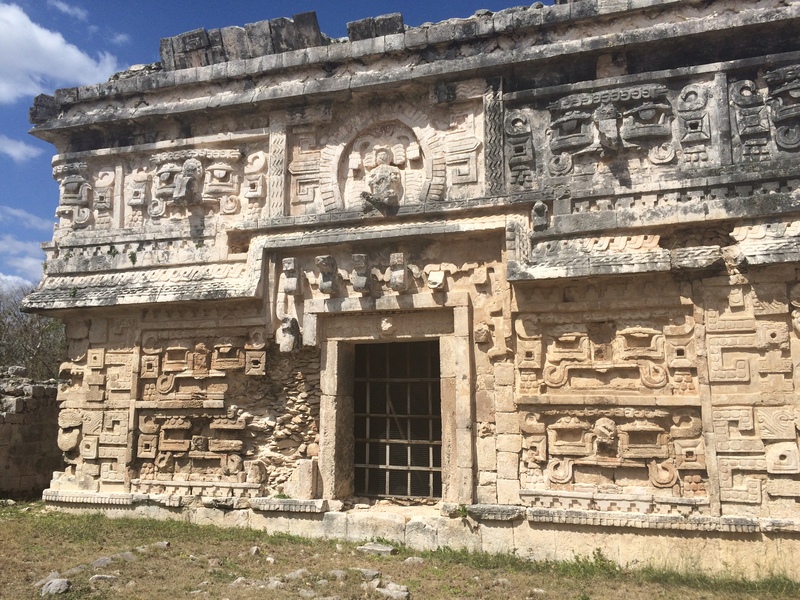 After the magnificent ruins of Chichen Itza we went on to Merida, which I will write about in my next post!